Intriguing Hair selling high quality Cambodian Bodywave wig extensions, hairstylists, celebrity hair extensions online at affordable price. Free Next Day Shipping. Shop Now! Our most popular texture. It is important to state this hair does not get curly when wet. Intriguing Bodywave holds curls longer than Intriguing Straight. This hair can also be easily flat-ironed bone straight. It is not meant to be left in its natural state. It does have to be styled. Once styled, most clients use flexi rods at night to maintain the hairstyle. We have clients that have worn the same batch for several years. 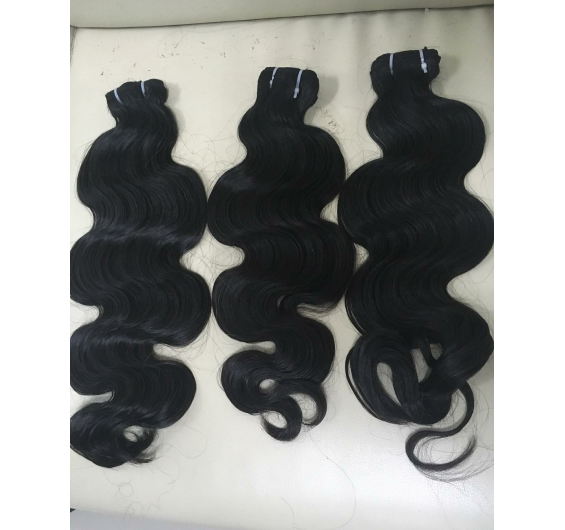 Intriguing’s Cambodian Body Wave Bundles are silky smooth and full of body. Sultry waves and a deep bend pattern make this one of the most requested styles among our clients. Made from 100% unprocessed virgin hair, we sell only the best Cambodian hair extensions. Hair may be washed, cut, or heat styled with ease. To maintain the waves, simply use flexi rods at night. Best of all, Cambodian Body Wave hair extensions can be styled in a variety of ways to change up your look. You may use a flat iron at medium-high setting for a flawless bone-straight finish or curl the hair any way you like. Cambodian body wave hair has a body wave texture this helps hold curl better than straight styles. This is a popular texture for our African American ethnicity clients. Cambodian hair is the thickest all the hair types we carry. It is important to note the hair is wavy but will get wavy when wet. Each bundle weighs 3.5 oz. We recommend purchasing two bundles for lengths 16” or less, three bundles for 18-24” lengths, or four bundles for 25” or longer. Please select length and any customizations above. Can be purchased in lengths 12-30 inches.